December 17, 2009: SBMUG’s Third Annual Winter Festival and Pot Luck, at the Natural History Museum’s party-friendly Broder Building. SBMUGers brought their favorite delicious hot or cold dishes to share, and drinks were be provided by our wonderful refreshments team. November 19, 2009: SBMUG member Harold Adams walked us through various features of iPhoto for processing images and managing photo collections, and gave us some additional insight on iPhone setup and development. 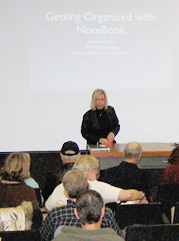 October 15, 2009: SBMUG member Anita Donohoe showed how to set up and use the very popular social networking site Facebook. Anita demonstrated differences between the owner’s view and the visitor’s view, and showed how to control the extent to which a Facebook user’s comments are public. She also discussed caveats about playing games and using Facebook applications, which allow access to account information. There was also a brief discussion covering the micro-blogging site Twitter. 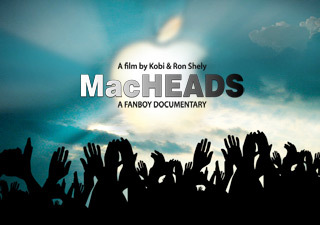 September 17, 2009: SBMUGers brought their popcorn, beverages and bon bons to enjoy during a special free showing of “MacHEADS – A Fanboy Documentary” exploring the cultural phenomenon that is Macintosh and the extraordinary loyalty and obsession of Apple users. A copy of “MacHEADS” was given away at the meeting. 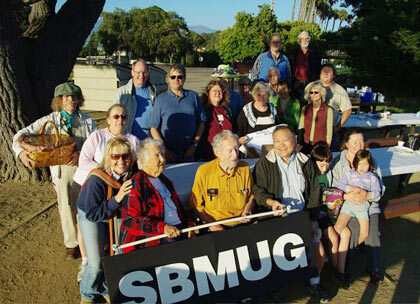 August 20, 2009: SBMUGers met for our third annual pot-luck picnic at Goleta Beach! See more photos, from our picnics in August 2008 and July 2007! 5. How to get media off your iPod (when it’s your only backup): Use Podworks (shareware, $8) to transfer data from your iPod to your repaired Mac. (Podworks does a more complete job than other similar utilities.) 4. How to “rip” DVDs you own to backups (“4-year-old + beloved DVD = disaster”): Use Ripit ($18.99) to extract the data from the disks, then back them up to an iPod, iPhone or Apple TV using HandBrake (free) to convert them. 3. Steve Jobs’s home phone number: 555-555-1212 (according to Chris, and we pretended to believe him). 2. Subscription music services such as Napster ($5/month) are good for music you don’t expect to “stay fresh,” and give you access to explore different genres. Of course, subscriptions don’t preclude purchasing music. Sonos, based here in Santa Barbara, offers systems to play different music in each room of your home. 1. How to “jailbreak” and unlock the iPhone to use a different phone company, to tether, do MMS, travel abroad with a SIM card and pay local rates instead of roaming charges, etc. : The iPhone Dev Team Portal is a good place to start. Note that jailbreaking is not for the fainthearted! It breaks your license, and jailbroken iPhones are disabled by Apple’s software updates until the iPhone Dev Team comes up with a fix. Q & A: What’s new at Macworld Magazine? It’s “Macworld” now, and mostly on the web. The web edition comes out first, but the print edition benefits from corrections and comments submitted by readers of the on-line edition. Apple’s future products? Laptops, iPods, iPhones; not so much desktops. Apple currently has over 90% of the over-$1000 PC market. What’s next? Snow Leopard (OS X 10.6) will be faster, but will work only on Intel Macs. Maybe a tablet (but not a netbook) with a keyboard and gestures. Google OS? For netbooks, maybe. Copying Audiobooks to iPod? Audiobook Builder puts Audiobooks on your iPod as single tracks with chapter markers. 4G iPhone? 4G is capable of much faster speeds than 3G, could deliver DVD-quality streaming video. Apple may talk with Verizon about a future 4G iPhone but currently has a commitment to AT&T. Do Macs need antivirus software? Viruses are rare on Macs, and AV software has been nothing but problems for Macs. Chris doesn’t use AV and hasn’t had a Mac virus in years. June 18, 2009: Photojournalist Dibblee Hoyt showed us examples of his work and how he uses the 15 elements of style, and told us stories about the people and scenes in the photos. A few of the elements of style: The rule of thirds (if you put the point of interest in the center, it will be boring). Linear perspective (to take you deeper into the photo where something interesting is happening). Framing (surround the subject with something that frames it: foliage, doorway, an arch). Controlling depth of field (to make the subject stand out from the background). Abstracts (telling the story of just a part of something, detail shots). Lighting (using available light, knowing when to turn the flash off!). Dibblee doesn’t use iPhoto to back up images but uses backup software and an external hard drive instead. He also gives CDs of images to others so there are redundant copies around. When photographing a wedding, he uses iPhoto to get a slide show going by the time the wedding is over, saving it as a QhickTime movie. May 21, 2009: This month’s Q&A covered a range of subjects: face recognition in iPhoto ’09, a misbehaving Quicken file, dropped wireless connections, backup strategies, memo software for Mac & iPhone, and organizing files — why not a Miscellaneous folder? 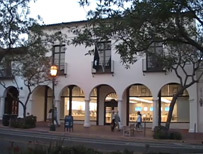 But the big news this month was the grand opening of the Apple Store at 928 State Street, the historic building formerly occupied by Pier 1 Imports. Many people, including a number of excited SBMUGers, waited in line for hours for the 10 a.m. opening on May 16th. 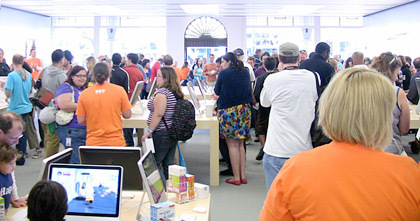 The first thousand visitors were given handsome black Apple shirts. 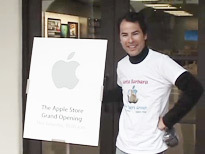 Harold Adams presented a video he and Ian Lessing made, “Santa Barbara Welcomes the Apple Store”. You can see it on our “Film At 11” page. Here are some scenes from the event. April 16, 2009: Michael Williams, Founder and CEO of Santa Barbara based iTMP Technology, showed us his company’s pioneering wireless hardware and software for health and fitness applications. iTMP’s SMHEART LINK is a wireless bridge between iPhone or iPod Touch and a growing list of popular ultra-low power fitness sensors. Its “dual-mode” capability works with 5kHz analog and 2.4GHz digital monitoring devices, and integrates them with iTMP’s suite of fitness apps. The applications — iBPM+™, iNewLeaf™, iRPM™ and iSpinning™ — include a cardio fitness system, spinning and cycling computers, and software to help you exercise at the right intensity as you monitor workout time, running or walking distance, heart rate, fat calories and total calories to achieve better results for any health, weight loss, fitness or athletic performance goal. March 19, 2009: Dirk Reynolds discussed Filemaker Pro, the premier Macintosh and Windows database application, and answered our data wrangling questions and other Mac related issues. Dirk is founder and CEO of ZWARM Intelligence, a provider of data management strategy and solutions. February 19, 2009: Our special guest was Jayson Adams of Circus Ponies Software, who showed us how to clear clutter and save time with Circus Ponies NoteBook 3.0. NoteBook is an award-winning application that helps Mac users manage all their notes, clippings, and to-dos, and the e-mails, diagrams and spreadsheets of their important projects. NoteBook helps keep it all organized and accessible with a familiar NoteBook interface, complete with pages and tabs, sections and subsections. It’s easy to add notes and other text, drag in files and folders, even “clip” web research, mail messages and other content into a NoteBook page without leaving the application you’re working in. Information can be annotated with diagrams and sketches, highlighting and keywords, even voice-annotated notes that you can download to your iPod. NoteBook even offers password protection, covers, and encryption. Here are some more features: Auto-sort with various sorting priorities; checkboxes on a to-do list (what a concept!). Illustrator pages can be dragged into the NoteBook. Addresses linked into a NoteBook change every time the Address Book entry changes. Multidex keeps track of all the attributes NoteBook saves — email addresses, URLs, highlighted words, keywords, images, stickers (icons, like visual keywords), attachments and their filetypes, even discarded filetypes; Change dates; Due dates; To-do (sorted by past due, current, and future! ); “Superfind”, like an “inspector” box with more detailed specs for finding stuff. You can drag in a photo, rotate, tilt it, turn off the edges, add corners; add an entire PDF; you can even include QuickTime movies in a NoteBook. Whoa! Movies and sound files too; you can even record voice annotations right in NoteBook! NoteBook pages can be sent to other NoteBook users as a page bundle, or exported as PDF with live links or even as a website. NoteBook 3 even has handwriting recognition! And it’s all indexed. Already. January 15, 2009: Our annual Macworld Expo review! Several SBMUGers recounted their impressions, and Harold presented a slide show and a 9-minute movie of the sights in San Francisco as well as in the Expo. Ninety percent of Macworld vendors show stuff we never see in the Apple Store. There’s also a sense of community among Mac users and the people who make the products. Want more details? 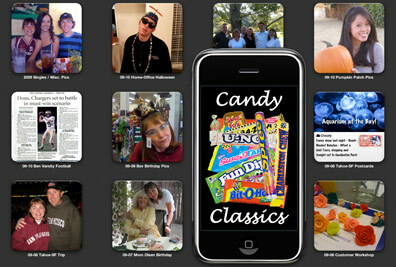 Have a look at Macworld Magazine’s Macworld Expo News.